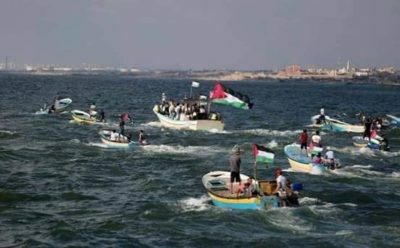 At the 18th weekly Naval March, hundreds of Palestinians gathered along the northern coast of the besieged Gaza Strip Monday. Nine Palestinians were injured by projectiles shot by the Israeli army, while dozens of other protesters suffocated from tear gas. The nine casualties include 1 hit with live ammunition, 4 with rubber-coated steel bullets, and 4 were shot with teargas canisters Ma’an News Agency reported. The Israeli Navy also opened fire at the 30 Palestinian boats as they attempted to break the siege.. The nine victims of Israeli use of force were treated at hospitals instead of field clinics. Palestinians have been protesting since March 30 of 2018, last Friday at the 36th weekly Great March of Return, 28 protesters were injured by Israeli forces.